I read biographies. I’m fascinated by lives, and sometimes imagine myself in the shoes of those I study. That wasn’t easy to do with Albert Einstein, whose Walter Isaacson bio I recently finished. I thoroughly enjoyed this book, but had little grasp (to put it mildly) of the physics that popped from its pages. That doesn’t bother me because Isaacson is such a skilled writer that I don’t need to understand the math to enjoy the man. Einstein, flawed as any of us, had not only brains, but wisdom, at least when it came to philosophy and epistemology. Akin to wisdom is humility, which displays reluctance to exaggerate one’s own grasp of everything. All players, even the strongest, go into the game with a knowledge of personal limitation. Einstein was mentally strong, but in his estimation he was of no particular talent, other than being passionately curious and imaginative. Most of his work started by imagining things via a process of visual thinking. He imagined what it would be like to ride alongside a light beam. There is a short chapter in the book entitled Einstein’s God. Isaacson wrote about a dinner party where Einstein dismissed astrology as superstition. Another guest took the opportunity to likewise dismiss belief in God as superstition. “At this point the host tried to silence him by invoking the fact that even Einstein harbored religious beliefs. (Isaacson, pg. 384). Einstein’s answer to the surprised skeptic was “Yes, you can call it that” . . . “Try and penetrate with our limited means the secrets of nature and you will find that, behind all discernible laws and connections, there remains something subtle, intangible and inexplicable.” (Isaacson, pg. 384). Let me pause and share a personal note to believer and skeptic alike. I’m not trying to force Einstein into the fold. I’m an Evangelical Christian, with specific beliefs in doctrines of faith and morals, with specific convictions that some things are true and other things are not. Too many believers and non-believers (like the dinner guest Isaacson recalled) have tried to grab Einstein for themselves, and I’m not doing that. Einstein was not an Evangelical Christian, maybe only a deist. But nor was he a “professional atheist and positivist*”. Einstein had his dogmatic religious period which he shed at age 12, after his exposure to science. As an aside I’d suggest not putting too many of your life-long philosophical eggs into your 12 year old brain basket. The prefrontal cortex is still a dozen or so years away from full development. Strive to retain what Einstein shared with his friend, psychiatrist Dr. Otto Juliusburger: “People like you and me never grow old. We never cease to stand like curious children before the great mystery into which we were born.” (Isaacson, pg. 15). Or, to put it another way, try not letting your 12 year old brain think it’s all grown up. If you made an early decision to put away your religious “toys”, you may want to dust them off and re-examine their value. My point is that Einstein displayed wisdom in refraining from asserting what cannot be asserted, specifically, that there is no God, or that there is no evidence for God. For Einstein the assertions of “professional atheists and positivists” displayed inherent weakness. Isaacson quotes from a letter Einstein wrote to Romanian philosopher/mathematician Maurice Solovine: “I have no better expression than ‘religious’ for this confidence in the rational nature of reality and in its being accessible, to some degree, to human reason. When this feeling is missing, science degenerates into mindless empiricism.” (Isaacson, pg. 462-463, italics mine). Alright already, I can imagine you thinking, this is all very interesting (or not), and it’s obvious I’m writing as a believer and not an atheist, but what in the E=mc² does this have to do with Art & Whimsy? Our good friends Bob and Chris gave us this plush Einstein. Whimsical, isn’t he? Bob and I like to read books and then discuss them at a local establishment. 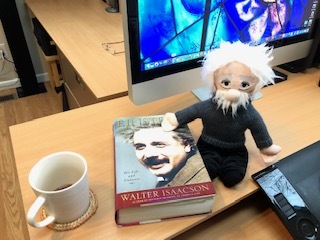 We both recently finished Einstein and will spend time together in lively conversation. 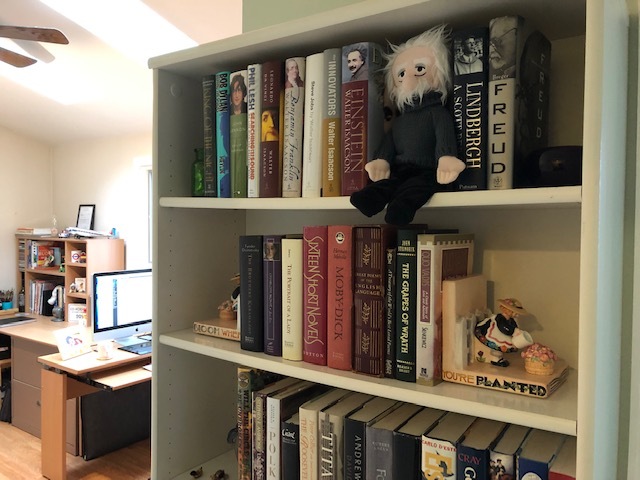 Albert now sits alongside his biography on the top shelf. The bookshelf he occupies is a sort of segway into my studio, almost like a small entrance foyer. Maybe he’ll serve as a small reminder that my average workday should involve a blend of truth and awe, wisdom and wonder, art & whimsy. Einstein never lost his sense of childhood wonder. His famous quote, “imagination is more important than knowledge” could be something of a credo for people who cannot satisfy themselves with mere positivist empiricism. In the Christian circles in which I travel, we like to say we were created for something more, and that things are not the way they are supposed to be. I adhere to a catechism that says we were created chiefly to glorify God and enjoy him forever. There is joyful purpose in creation, and we all need to be restored to that purpose. As I consider the “enjoy him forever” phrase, and its many implications, I can’t escape that “enjoy” is key to the idea. Empiricism alone, in my thinking, would drive one away from awe to cold indifference toward the world around them. The universe might present itself to some happy empiricist as a fun problem to solve, but accordingly the universe might be regarded as an indiscernible morass of meaninglessness. Its animated assortment of atoms (us), no more than an inexplicable grouping of biological systems existing only to eat, couple, age and die, and sometimes not survive long enough to do even that. Not much whimsy in that. I posted some photos on FB this morning. I’m delighted with my new in-home studio and had fun arranging my silly stuff. 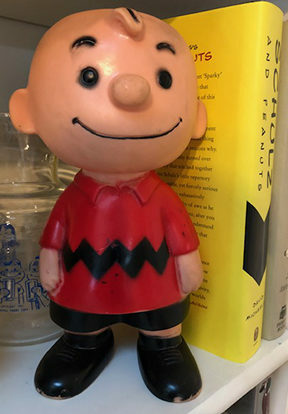 Here’s my Charlie Brown that Anna gave me, which brought real, meaningful, tears of joy. I set up an assortment of toys, stuffed critters, children’s books and all kinds of goofy things that help me giggle while I work. There is purpose in the art I make, and much of that purpose is to spark whimsy and nurture our longings for a day when joy will be constant. This isn’t just wishful thinking, but substantial thinking. The substance of the Good News is that Jesus came into this world to save sinners (like me), to undo death, and to make all things new. I’m okay if some think I’m a loon for believing this. I can assure you I believe there is all kinds of solid evidence for it. I also think there is great value in allowing my mind to run wild with hope, imagination, whimsy, and to reasonably deduce that nothing else will do for a world gone wrong. And that’s what Christmas (and Easter) is all about, Charlie Brown. *Positivists adhere to a philosophy that every justifiable assertion can be scientifically verified or is capable of logical or mathematical proof, thereby rejecting metaphysics or theism.